Afghan authorities have received more than 3,000 reports of violations from last weekend’s presidential election, exceeding the tally following a 2009 vote that was marred by widespread fraud. But just half the 3,103 complaints registered so far will be investigated, a complaints commission spokesman said, since the rest were reported by telephone and lacked the required supporting evidence. The three frontrunners have all complained of fraud in the April 5 vote meant to usher in Afghanistan’s first democratic transfer of power, as incumbent Hamid Karzai prepares to step down after more than 12 years as head of state. Midnight on Monday was the deadline for reporting fraud and any irregularities, but the final figure is expected to rise as reports flow into Kabul along with ballot boxes from around the country. A final tally could take days to become available, since observers, voters and other parties all had means to lodge complaints at polling stations. “As soon as we get them, it is clear the final number is going to increase,” said Nader Mohseni, spokesperson for the Independent Election Complaints Commission. More than 2,000 complaints were investigated during the 2009 elections, which were tarnished by fraud that led to more than a million votes being scrapped. Complaints against election commission staff made up 772 of the 1,573 complaints backed by documents this time round, with another 573 aimed at provincial council candidates, while presidential hopefuls faced 228 complaints. 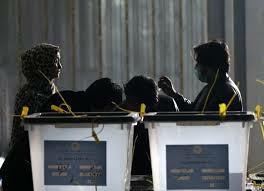 Afghanistan held provincial council elections the same day. World leaders have praised the April 5 vote as a success, because of the strong turnout of voters, estimated at 60 per cent of the 12 million eligible, and the failure of the Taliban to stage high-profile attacks on the day. Urban participation was unexpectedly high, but it is unclear to what extent rural voters were deterred by the militant group and what role state officials, including the police, had in encouraging civilians to back a particular candidate. In Afghanistan’s second city of Kandahar, for instance, residents complained police forced them to back a candidate supported by President Hamid Karzai’s brothers. Karzai’s administration said it would investigate fraud at every level. “The ministry is committed to prosecuting individuals at any level, whether he is a provincial police chief, deputy minister or ordinary policeman,” said interior ministry spokesperson Sediq Sediqqi. There are also fears the Taliban may exploit easing security in the capital and elsewhere to ramp up attacks during the lengthy ballot counting process. Preliminary tallies put former foreign minister Abdullah Abdullah in the lead in Kabul, but it could be weeks before a countrywide winner emerges. Expectations are growing that Abdullah will face a runoff with Ashraf Ghani, a former World Bank official with a programme of radical economic reform.